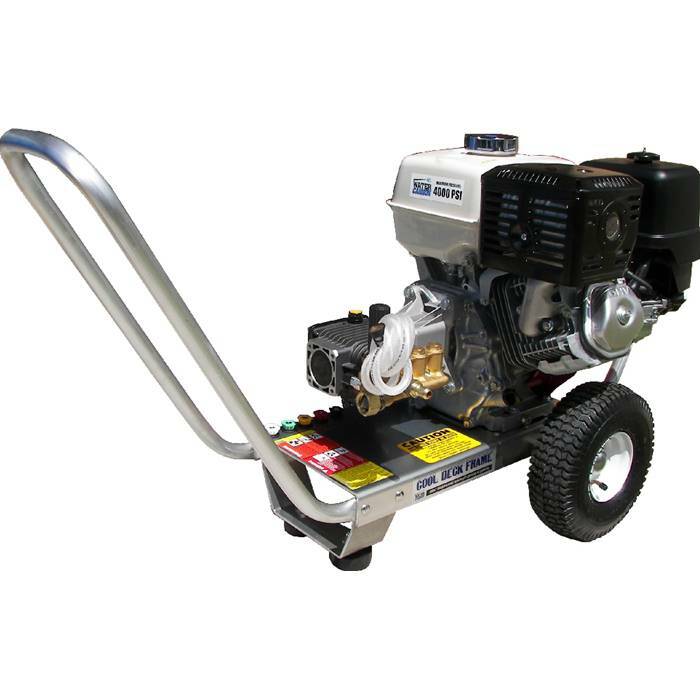 The aircraft grade frame on which the pressure washer rests has two handles for maximum maneuverability and no welds to ensure utmost strength and survivability. Two oversized tires and two shock-absorbing feet provide a stable platform for the pressure washer and also make it easy to transport around job sites and to offsite jobs. Also standard with the 4,300 PSI Honda pressure washer is a thermo-sensor that automatically prevents overheating in bypass mode and protects the pump from potential damage. An adjustable pressure throttle offers the operator complete control over water pressure in order to allow the user to address a vast variety of applications, including those that require a more gentle approach. Included in the price and packaged with each pressure washer upon shipping is a complete accessory kit with a 50-foot-long high pressure hose, gun and wand assembly, a soap and chemical nozzle injector system, four color coded spray nozzles and one color coded chemical nozzle. As a result, this washer is essentially ready to use as soon as it arrives. Pressure washer Safety Rule; always wear earprotection to cut noise and eye protection and or a face shield toprevent debris from flying or ricocheting into your eyes or face whichcould result in serious injury.